FIlmmaker Christiaan Olwagen’s enchanting coming-of-age musical dramedy set in his homeland of South Africa takes a trope of extreme obstacles facing gay men in the 1980’s with such an inspired touch that makes this such a sheer joy of a movie. It’s the tale of teenage Johan Niemand (Schalk Bezuidenhout) who although he lives in a remote one-horse country town where he is bullied by the local youth for his effeminacy, he is also encouraged by his gal pals to dress up in drag and dance to the music of his beloved Boy George. When he gets drafted to do his compulsory two years Military Service, to avoid having to take part in the War he manages to get accepted into the Canaries which is an Army Church Choir (something of an oxymoron). 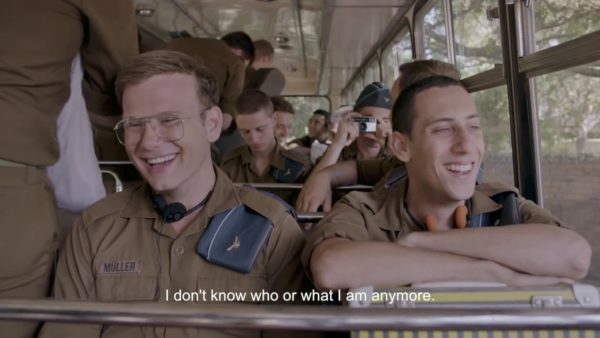 Clutching his precious collection on New Wave records he boards the train to the camp and his horrified that the first other recruit he meets is the very flamboyant and very gay Ludolf (Germandt Geldenhuys). His initial reaction is one of horror fueled by the thought that any association with Ludolf would also out him too. They do become good friends as they bond over the bullying tactics by their sadistic Platoon corporal who believes that they have too easy a ride as a choir. A lot of the other members of the his Unit seem to have their own self image issues which manifests in considerable vitriol and hatred amongst them . Partly spurred on by them all being away from home for the first time, and their own personal securities and the sheer pressure of being part of an ultra-conservative racist society. Jonah soon develops a friendship with another choir member named Wolfgang (Hannes Otto) as they have identical tastes in music. They spend a lot of time together and grow closer and eventually fall for each other. Rather than this be an exhilarating moment for Johan, it actually fills him with panic and guilt as his deeply religious background makes him feel so wretched about his sexuality which he really cannot deny now. As well as struggling with his own thoughts about the situation, Johan is also petrified about the Army’s rampant homophobia and the drastic consequences that could ruin his future if he was discovered. This all plays out against a background of a country that is fighting to retain its white supremacy, in which the Choir’s Reverend leader preaches from the pulpit is a war that God wants them to win. Olwagen’s movie is however far from doom and gloom as he imbues his script with a real sense of humor, and thanks to his very talented three leading actors, develops characters that are not only extremely likable but ones that we really get engaged in. Bezuidenhout excels as the deeply introspective Johan but in real life is one of South Africa’s most famous stand up comics. Kudos too for the soundtrack from the Boy George hits that allowed Johan to come out of his shell to the beautiful choral singing that the Canaries toured with whether the troops wanted to hear them or not. The film is remarkable insight into how gay men struggled with their sexuality in a country that was desperately clinging on to its immoral past. Olwagen’s wonderfully entertaining tale however fills us with hope that love will in the very end conquer all.